A Plot Window can contain multiple plots with multiple curves. It can also contain a mix of curve plots and 3D animation plots. Strip Chart is a special version of Tile Vertical with a common X-axis for all plots. To change the tile options, right-click on the plot window in the Plot Windows tree and select the menu Tile Plots. To change the order of plots within a plot window, you can drag-drop plots in the tree. 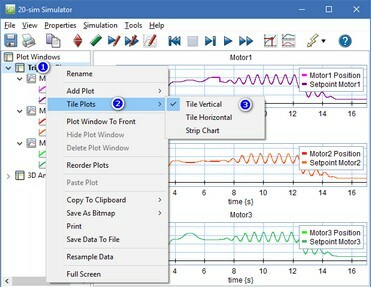 It is also possible to move a plot from one plot window to another in this way. Moving curves within plots and between plots is also possible via drag-drop.